It's nice to be able to say I finished two projects this week. 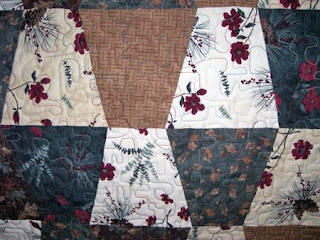 I finished snipping the first rag quilt and then I also finished quilting the Moda tumbler with a quilting "design" and finished adding the binding. 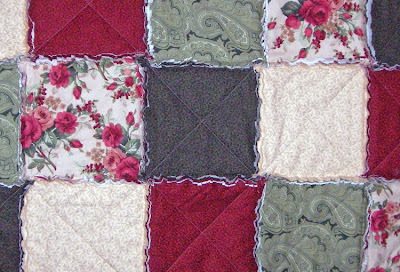 Here's a section of the finished rag quilt. I still have to wash the quilt to fray the edges. 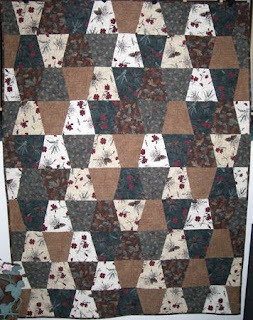 I binded my second Moda tumbler quilt with the leave fabric featured in one of the blocks. I quilted the quilt with a "stipple" quilting. I put "stipple" in quotes because it looks like a lot of alien fingers to me. 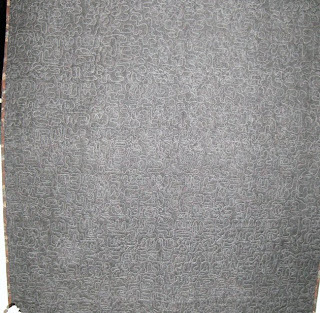 Just doesn't look good like other stipple quilting I saw. Although, it was fun. I laugh how I can tell the different sections I worked on during different days. My stippling changed. I figured this was more of a practice quilt for me since I was not too crazy about the fabrics. I used a red, white and blue thread. I figured everything matched except the blue but the blue was pretty dark so it kinda blends in. Here's some photos of my first overall "stippling" on a quilt.